and shallow keels, flat and curved sections of hull. I then dismantled sections of my old boat that I knew so well and attached the new shape to test against it. This was a way for me to be absolutely certain of improvement. What would eventuate would offer many advanced features. This kayak was not going to be just a new shape on the market. When happy with each improvement, I reattached the original shape to my old kayak, kept the new to build up a prototype and eventually end up with an active, lightweight completely new design to work off. Creating a lightweight active plug (original) was the most logical way to end up with what I wanted. Designs are usually shaped out of a solid then molded. The designer often has little idea how the boat will really handle until the first one is launched. Already I knew this kayak was going to be an exciting performer with a unique look and feel. But this was only the beginning. I still only had an active plug. There was much more work to do. In those early years, sea kayaking was the only thing I did. I traveled thousands of nautical miles in all points of the compass and stayed away for months at a time. In Papua New Guinea, I came across people that for thousands of years traveled the open oceans in sea canoes. They had identical bow shapes and keels to some of the Arctic kayaks but rounded hulls. In 1986 I traveled to Greenland. Here I learned more on the importance of clever design. Each village I kayaked into had the same small cockpit. The reason for this is that it allows for total bracing. When in wild conditions you can’t be caught off guard, and have your knee accidentally flip the splash cover off. The small cockpit also allows for more variety in techniques when rolling and bracing and strengthens the kayak, while minimizing pooling and cover leakage and the possibility of cover implosion in rough seas.Any knowledge I could gain on technique and design I soaked up like a sponge. The Greenland expedition, which had taken me there in summer 1986, was running two months behind due to circumstances beyond control. This gave me time I never expected to have to study the kayak designs and the environment in which they were used. It was now winter The only other expedition to kayak the Arctic East Greenland in the beginning of winter was Gino Watkins in the early 30s, who mapped the coast. My Greenlandic friend Dikka said he thought that would be okay, so I Australianised the name to Pittarak. 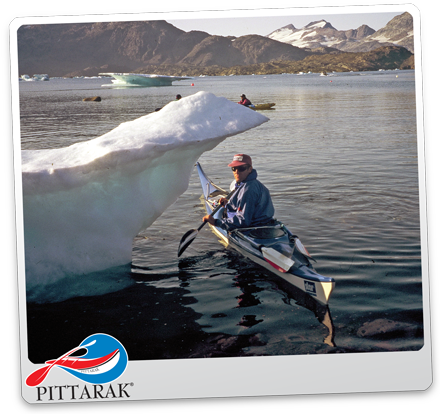 Dikka’s father and grandfather were the hottest kayakers in East Greenland. 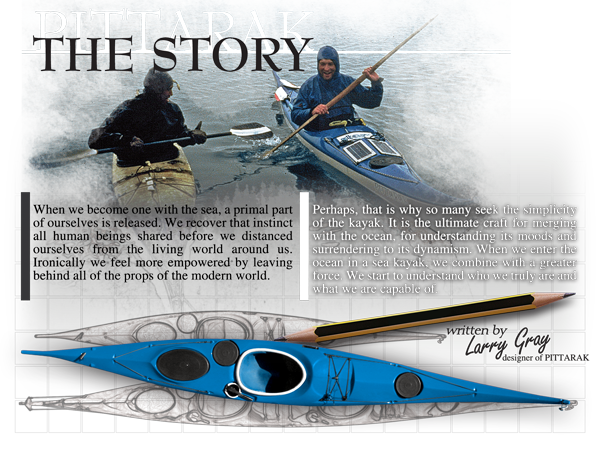 I lived with the family for some time and just stood back in amazement on some of the stories I heard.Back home, armed with fresh respect for the kayak, I continued refinement of the Pittarak. The length was important to maximize internal storage yet remain controllable in a gale. The keel shape needed to be very “ liney” as overly rockered hulls slow up considerably when laden, pushing water in front and sucking from behind. Very maneuverable on a wave, but less controllable on a long journey especially in a gale due to poor tracking ability. Maneuverability was built into the Pittarak design via the gunwale shape. 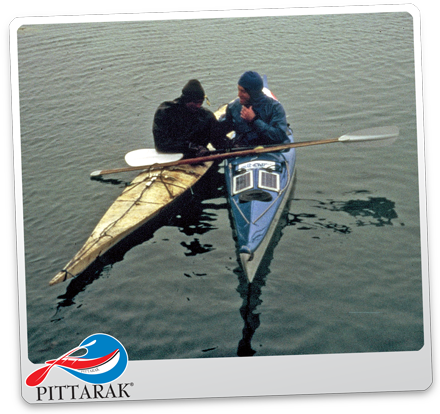 While leaning the Pittarak over, the keel raises to the water surface creating bow and stern steerage, aided further with the paddle. When leant right over, the gunwale levers the keel enough to pivot totally end for end even when laden.Designed for efficient handling when full of gear, the nose shape is similar to the kayaks of Alaska, Labrador, areas of west Greenland as well as Pacific Ocean-going canoes. It descends and rises through the water with minimal disruption because of the upturn. The tail is the same as the nose, being not overly buoyant. This is to limit the amount of time spent in the air due to chop throw. The shape reduces hull slap and allows greater control in strong quartering head winds. The foiling shape prevents the nose from pearling deeply at speed in a following sea. The hull shape is designed not only for directional control but also to broach squarely on a wave even when fully laden. This is important. At the tail, the hull has two faired surfaces each side of the keel to incline the kayak by creating slight tail lift when the kayaker leans forward. This assists in riding swells in a following sea, thus great distances can be achieved with minimal energy .The keel is gently curved at the tail and bow to avoid hang ups when launching from rock or steep inclines. The deck has triangulation to disperse water and add strength. The forward deck step is multi- functional. It deflects direct water impact from shooting under the nav charts, its also the strongest point for a mast attachment, if a capsize occurs when sailing in strong wind, at speed or on a swell, there is less chance of any deck damage taking place. It is also a take-off point for a parafoil rig, which loops to the nose. As a dash panel, it’s a safe place to mount a switch if needed. Pittarak 1, 2 and 3 evolved with curved lines. A chined Pittarak is in the making. For the lightweight traditional enthusiast.